In French “chiner” means to spend time in flea markets, garage sales and the like, looking for good bargains and fine objects. Aux Comptoirs du Chineur is in fact the shop of someone who loves to do that and spends days looking for things. 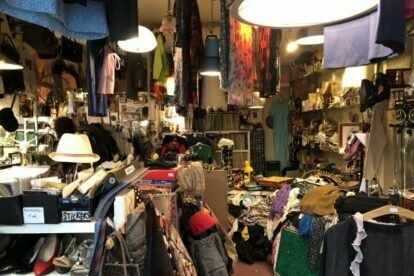 The result is a fantastic bric-a-brac where I found old vinyl records, ancient toys, sunglasses and clothes of any vintage like, photo cameras, tools, arcade video games, postcards… anything you like. Nested in the area of the “Village Saint Paul”, near Le Marais in Paris, this shop is a fantastic place to spend some time looking for treasures, or to ask for a specific item. The place looks completely chaotic, with things piled up on each other and some dust on top, but the owner knows by heart where things are placed, and will search for you in the most hidden places. Very good for discovering old vinyl records (last Sunday I found an original of the soundtrack of “Local Hero” by Mark Knopfler) and for anything vintage.